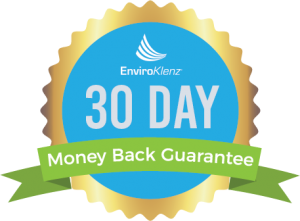 The EnviroKlenz® Mobile Air System is your solution to improving your personal environment air quality through an “adsorptive neutralization” process for chemical odors, fragrances, and VOCs, combined with HEPA filtration for particulates and allergens all in one system. 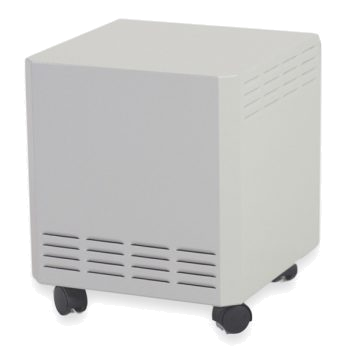 Since the multistage treatment and filtration approach is enhanced with the patented EnviroKlenz technology, it is effective for a broad spectrum of indoor environmental sensitivity triggers.The small size of the air processor allows it to be portable and easily maneuverable. A multi-speed blower offers the quiet and efficient airflow. 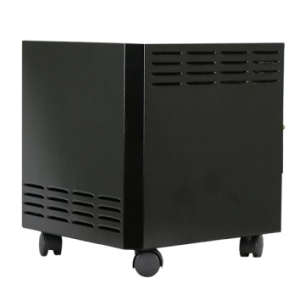 The low setting allows for near silent operation while still maintaining air flow. Medium to High speeds creates maximum air efficiency at noise levels still suitable for residential and commercial use. 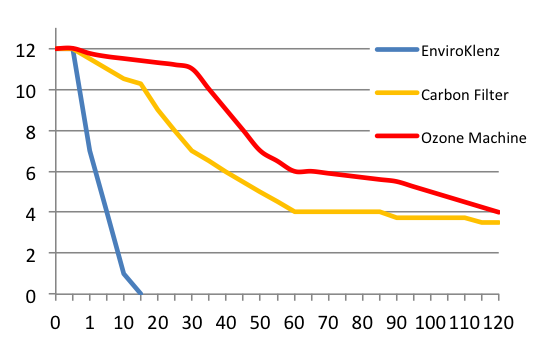 The graph to the right illustrates the reduction of a chemical compound (hydrogen sulfide) in an environmental chamber over a period of two hours by an EnviroKlenz System, Carbon Filtration (with HEPA), and an Ozone Machine. 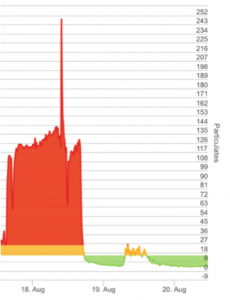 The concentration of the chemical is listed in part per million (PPM) and graphed over time in minutes. The carbon filter and ozone machine were not as fast or as effective as EnviroKlenz which was able to reduce H2S to 0 PPM in less than 20 minutes. Additionally, the ozone machine released harmful levels of O3 that took several hours to dissipate. EnviroKlenz is fast and safe. 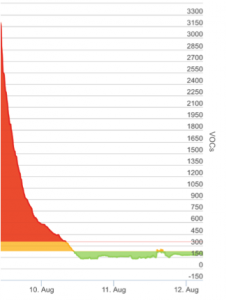 To illustrate EnviroKlenz’s impact on VOC reduction in an environment, the VOC levels were monitored in an office work environment on site at a production facility. The air was monitored for a period of two days, then an EnviroKlenz Mobile Air System was deployed. As you can see the VOC levels dropped and did not spike as they did they previous days leading up to the use of the system. The same study was conducted the following week and the results were the same. 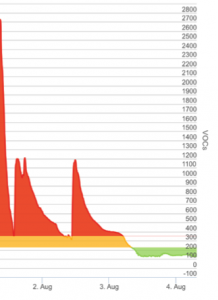 As illustrated in the image to the right, the VOC levels before the EnviroKlenz Mobile Air System deployment spiked during the daytime production hours, while they remained relatively stable after the system was deployed. The final image above looks at the impact on the reduction of airborne particulate matter. The facility where this was conducted has a particular process that generates dust and particulate matter during extended production hours. The production process was running on both days below (August 18 and 19), but the EnviroKlenz System was only deployed on August 19. A significant reduction in particulate matter was observed through the use of the EnviroKlenz Mobile Air System in that office environment.